X-23 was sort of a big deal back when she was released as part of Marvel Universe Series 3, not only because she was a clone of the ever-popular Wolverine, but also because she was developed using an entirely new female body mold. X-23’s costume is form-fitting spandex with a few extra attachments in the form of bracers and greaves, as well as a “X” buckle belt. These extra costume elements are accomplished via rubber pieces that slide over the calves and forearms and could be removed popping out the hands and the feet, although the belt piece is glued in place. 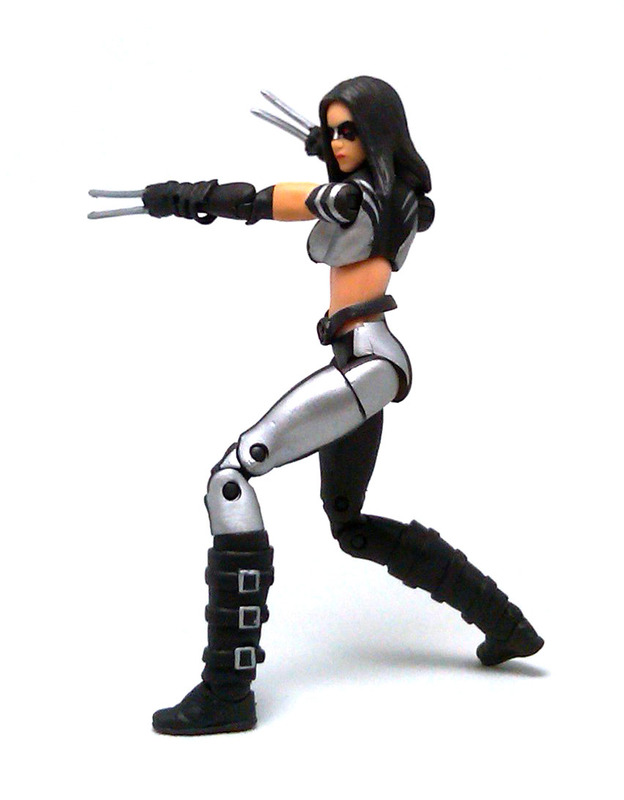 The truly unique pieces on X-23 are her hands, sculpted as tiny fists with twin adamantium blades extended, and the head, which consists of a fairly generic female face covered by a domino mask and a straight hair rubber wig glued on top. 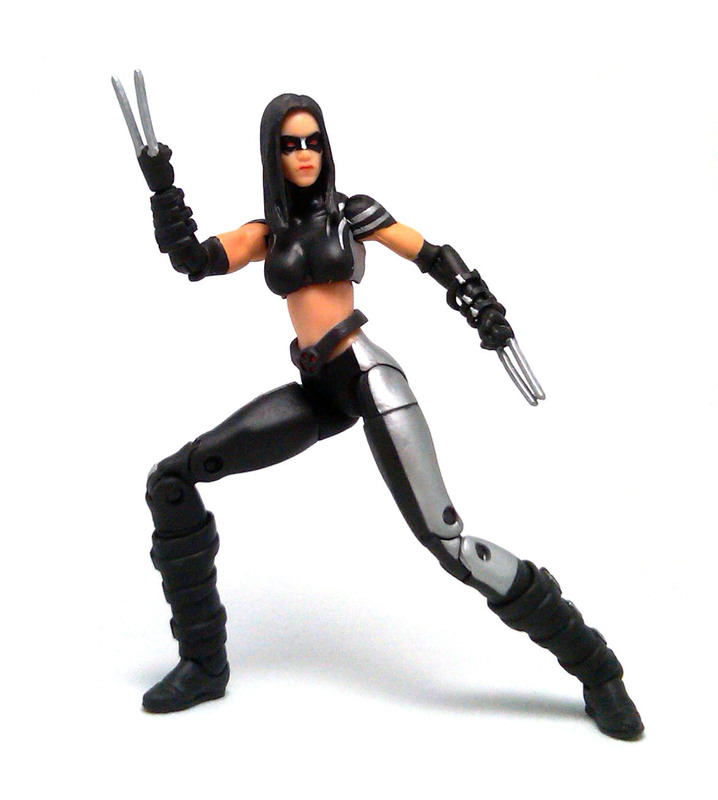 X-23 is supposed to be able to protrude two more adamantium blades, one from each foot, but I am quite content with the standard feet Hasbro gave her. Even though the hips are ball jointed (and G.I. Joe style, at that), their functionality is not really up to that of regular Joes because the upper thigh piece fits too snugly into the hip piece, but it is still possible to achieve fairly dynamic poses thanks to the upper thigh articulation that allows the leg to rotate and the ankle rocker configuration that allows for very stable poses. 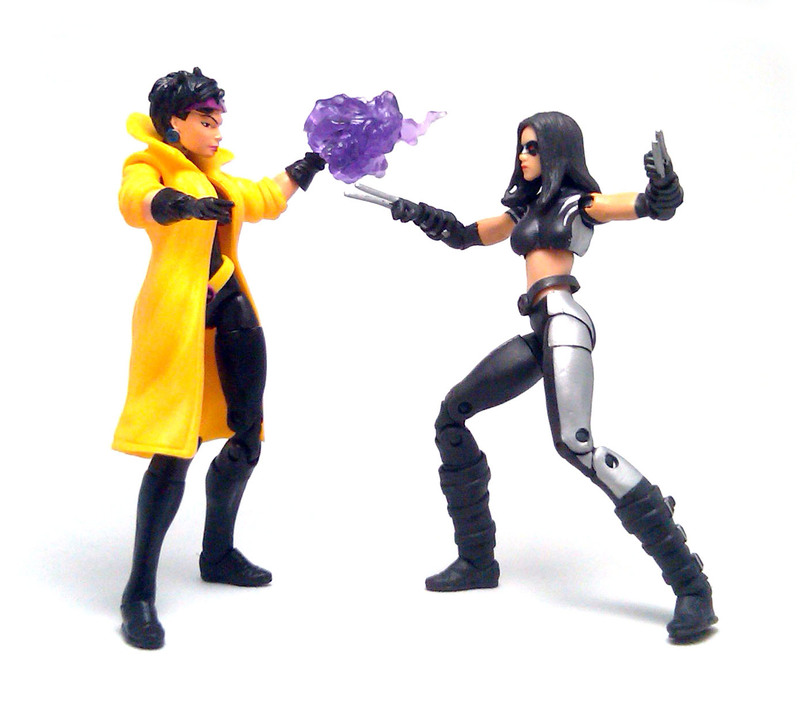 The paintjob on X-23 is fairly simple, but effective in portraying the silver and black uniform se got during her stint as a member of X-Force. 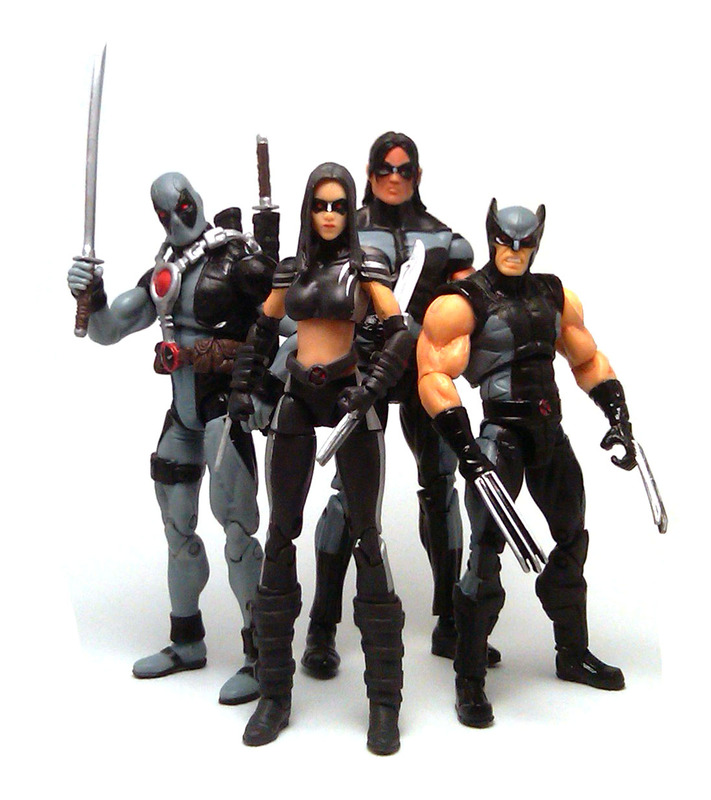 On a side note, so far only the X-Force characters sold on individual cards had had their uniforms painted in black and silver, and for the figures from last year’s X-Force 3-pack Hasbro went with a black and grey color scheme. The figure is molded in flesh and black colored plastic, so only the silver elements of her costume are painted on, with a few more small details like buckles and claws painted also in silver. On her face, the mask she wears is painted black with a thin line of silver painted over the bridge of the nose, solid red eyes and some lip color. 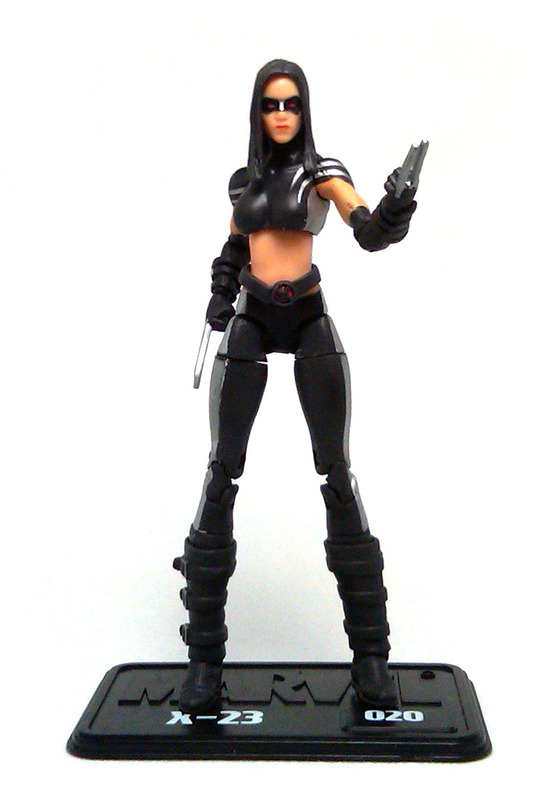 Like all of the individually carded basic figures released in Marvel Universe Series 3, X-23 only got a black plastic base with her name and number (20, by the way) stenciled on top. 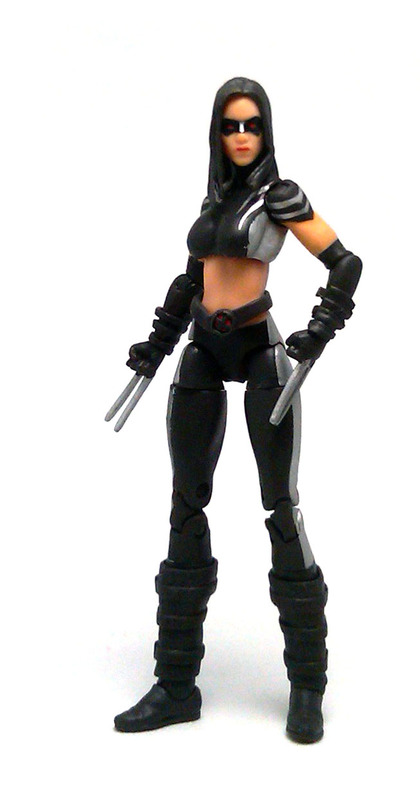 X-23 is certainly a pretty cool figure on her own, and even though I’m fine with the X-Force uniform, I hope we get at some pont another version with her regular outfit.